28 Dec	This entry was published on December 28, 2018 at 8:02 am. 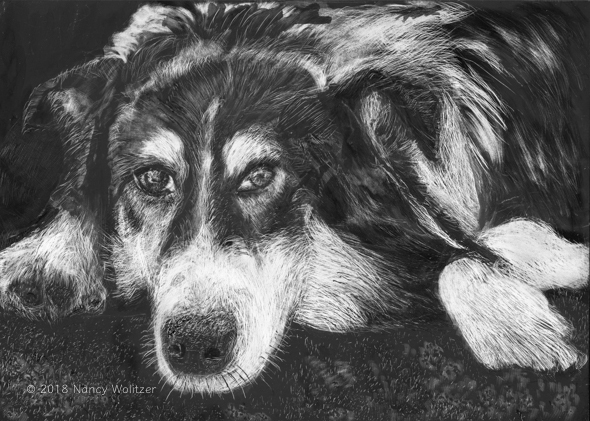 It’s filed under Artwork, Drawing and tagged animal art, Border Collie art, Dogs, Drawing, Nancy Wolitzer, Scratchboard. Bookmark the permalink. Follow any comments here with the RSS feed for this post. Nancy, I’ve never seen your artwork before. It is marvelous! How are you? Thinking of the old days at OUP. Thanks Gail for your kind words. I am well and it would be great to reconnect.